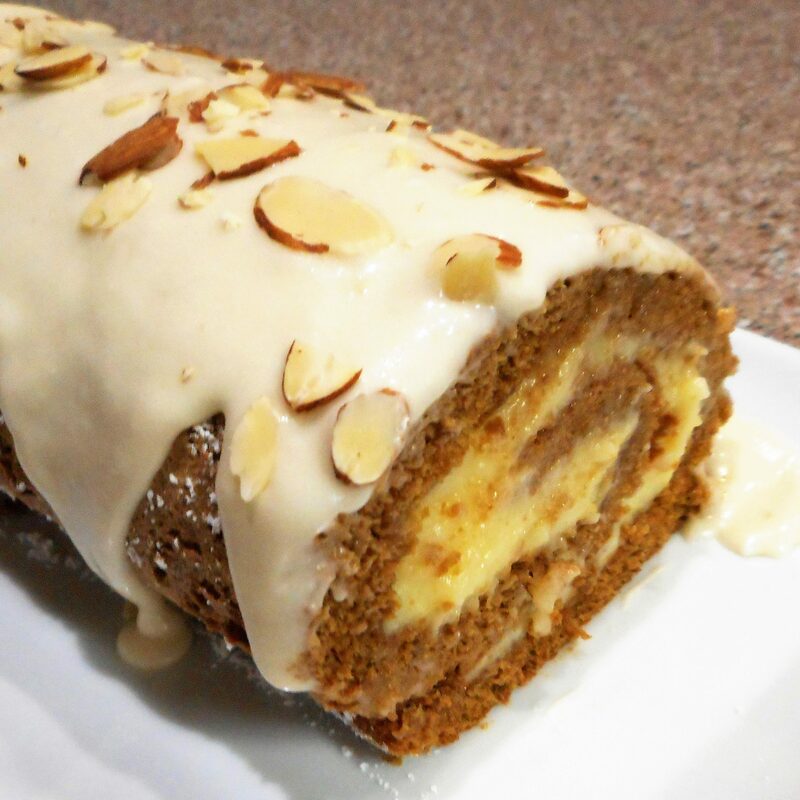 I think this Gingerbread Cake Roll is in itself a celebration of Fall! 2. In a heavy medium saucepan combine sugar, cornstarch, and salt. Whisk the egg yolks into the half- and-half. Gradually stir the half-and-half mixture into the pan. 3. Cook and stir over medium heat until thicken and bubbly. Cook and stir one minute more. 4. Remove from the heat and strain the pastry cream into a bowl. Stir in the almond extract. 5. Place the bowl of almond cream into a larger bowl of ice water and let stand 5 minutes, stirring occasionally. 6. Cover the surface with plastic wrap and chill for four hours or until cold. Do not stir. 8. Separate eggs. Allow the egg whites and yolks to stand at room temperature for 30 minutes. 9. Meanwhile, grease a 15x10x1-inch baking pan. Line bottom of pan with waxed paper or parchment paper and grease the paper. Set the pan aside. 10. Preheat oven to 375°. 11. In a medium bowl stir together the flour, baking powder, ginger, cinnamon, salt, and cloves; set aside. 12. In a medium mixing bowl beat egg yolks with an electric mixer on high speed about 5 minutes or until thick and lemon color. Beat in molasses just until combined. 13. Thoroughly wash the beaters. 14. In a large mixing bowl beat egg whites on medium speed until soft peaks form (tips curl). Gradually add 1/2 cup granulated sugar, beating until stiff peaks form (tips stand straight). 15. Fold egg yolk mixture into beaten egg whites. Sprinkle flour mixture over egg mixture and fold in gently just until combined. 16. Spread batter evenly in the prepared baking pan. 17. Bake for 12 to 15 minutes or until cake springs back when lightly touched. 18. Immediately loosen edges of cake from pan and turn cake out onto a clean kitchen towel sprinkled with powdered sugar. Remove waxed paper. Roll towel and cake into a spiral, starting from a short side of the cake. Cool on a wire rack. 19. Meanwhile, prepare Maple Glaze. In a small bowl combine powdered sugar and maple syrup. Stir in enough milk, 1 teaspoon at a time, to make a glaze of drizzling consistency. 20. Unroll cake; remove towel. Spread cake with Almond Pastry Cream to within 1 inch of the edges. Roll up cake; trim ends. Drizzle with Maple Glaze and sprinkle with almonds. Cover and chill for up to 6 hours.